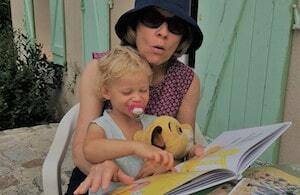 Learn French in immersion with French teacher Virginie and her family in sunny Provence. 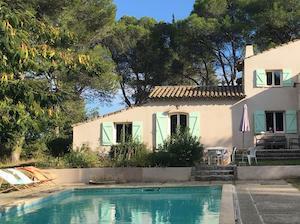 Imagine staying in a large and comfortable house with a swimming pool nested in the middle of a vineyard near Aix-en-Provence, two French adults & three kids to practice your French with and a dedicated French teacher to help you improve your French and guide you in this amazing region of France. Come alone or with your family or friends – the house has plenty of space – and experience French learning like never before. Bonjour, and welcome to our house. My name is Virginie and I am a certified DAEFLE French teacher. I taught French in Paris but also in Brussels, to diplomats, lawyers, politicians, and I also gave private classes to students of different levels. Therefore, I know how to adapt my classes to anyone who wants to practice/learn French. I also have an MBA in leisure travel and I worked for 10 years in the hospitality business. With French Today’s immersion program, I combine my two passions: teaching and traveling. Therefore I enjoy just as much as my students touring my region and love to talk about it. When you come to my home for a French immersion, you will experience an authentic French family lifestyle. My husband Alex and our three beautiful kids love to meet new people and will help you practice your French outside of the classroom. Alex, my husband, is a very open-minded and fun person. Just like me he loves traveling and meeting new people. We both lived in Australia in the past, and Alex also lived in Taiwan for a year. We are both fluent in English. I also speak German and a bit of Dutch, and my husband speaks Spanish and basic Chinese Mandarin. We have two boys, Léo (6 years old) and Tom (4), and one girl, Lily (2). They all have different personalities but are getting along pretty well. My kids are not shy and love to chat, so you’ll get a lot of French practice with them! They do go to school Monday to Friday, 8:30 AM to 4:30 PM, so we will also have plenty of grown-up time. We also have an indoor/ outdoor cat called “Fripouille”. He likes to be cuddled and is very friendly. Last but not least: we will definitely have fun together! Not just because your trip here is going to be memorable, but also because I cannot imagine life without fun, and I always try to bring lots of laughs and plays during my classes! Our house is located in the heart of Provence, next to the lovely village of Éguilles, just 15 minutes away from the town of Aix-en-Provence. The location is really private and quiet since the house is literally located in the middle of a vineyard. You can go on walks or bike rides in the countryside directly from our house, and enjoy the privacy of our large garden and of course, the refreshing swimming pool. It is a large typical Provençal house that has been entirely renovated. There are 5 bedrooms, a dining room, and 2 living rooms. There is a large fireplace which we love for the ambiance and the warmth and a large pool table. The kitchen and dining rooms are an important part of our house. I love to cook and shop at the local markets to purchase the freshest products, and there are plenty of organic options around here. Although we eat all sorts of foods, I will be happy to cook vegetarian, vegan or even gluten-free should you have a special diet. 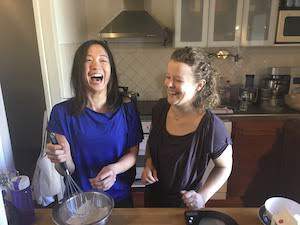 Cooking together is definitely a great way to practice your French: I specialize in cooking traditional French pastries, and I’ll show you how to do it if you are interested! Of course, I can also arrange some wine tastings at walking distance from our house since we live on a vineyard. We have a nice dining table indoors, but we often eat outside, on the patio. In any case, we enjoy quality family time at mealtimes, and we can’t wait to share this with you! Your room is bright and comfortable. There is a desk, a shelf, a large drawer case and a hanging closet to store your belongings, and a king size bed which can be split into two single beds if you prefer. It features a large glass door which opens up to the garden, so you have your own key and private entrance to come and go as you please. Both door and window have traditional provençal shutters for privacy and/or should you prefer to sleep in the dark. Because our house is an old renovated house, it remains quite cool in the summertime. It’s very quiet and safe here, so you’ll have no problem sleeping with the windows open if you want to. In the winter, the house is warm since it’s well insulated and we have a very good heating system. Adjacent to your room is a private bathroom equipped with a modern shower, a toilet and a sink. We have a simple lifestyle, organized around our young children’s rhythm: we are all pretty active, I enjoy hiking, biking, swimming, and practice dance and yoga. Alex plays soccer. And we all enjoy jumping on the trampoline in the garden! We are not big TV fans (but there is one in your bedroom), and prefer board games, reading or drawing with the kids, gardening, playing pool and finishing the day on the patio, under the stars, with a glass of wine. Our house is in the countryside, in the middle of vineyards, near the typical provençal village of Éguilles, a fifteen-minute drive from the historical town of Aix-en-Provence. Aix is a great place to visit, with a stunning architecture and history, plenty of shops, restaurants, and a great outdoor market… and it’s just next door. Provence is really full of treasures and depending on your preferences, I will take you to visit what most interests you. No doubt that you are going to love it! You can easily reach my place either by plane (Marseille airport) or by train (Aix-en-Provence TGV). A pick-up from these two places can be arranged for an additional fee. However, we recommend that your rent a car so you can be fully independent and discover the thousands of wonders around our place. My husband and I don’t smoke, and smoking is not allowed inside the house. You are welcome to smoke outside should you wish to. There is descent Wifi and cell reception throughout the house. Because we have a cat and a swimming pool, unfortunately, we cannot accept your pet. The pool is open, there is no fence around it. Although there is an alarm system, please understand that if you do come with children, it will be your responsibility to watch them carefully. 2 meals a day together – a copious breakfast and lunch. You can drive to Éguilles or Aix and enjoy your dinner in one of the many restaurants there, or store some food in our fridge for a dinner at home, it’s entirely up to you. Accommodation in your private bedroom + bathroom suite. Should you not rent a car, we can arrange for three meals a day for an extra fee. Please see the details with me. Given the size of our house, we can easily accommodate 1 or 2 persons but are also flexible for families or group of friends up to 4 adults and 2 children. My program is quite flexible and I will do my best to adapt it for your convenience, so never hesitate to ask if you have particular needs. Somatic therapy is a form of body-centered therapy that looks at the connection between mind and body and uses both psychotherapy and physical therapies for holistic healing. It helps to release the tension that can affect your physical and emotional wellbeing. I am currently following a training to become a certified somatic therapist and could help you with any problem linked to stress, anxiety, depression or addiction that you may have. The area I am more focusing on is the transfer of energy through mind-body exercises and soft massages. 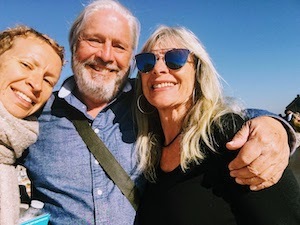 I indeed strongly believe that everything in ourselves is linked and connected: mind, emotions, body, and spirit. This is purely optional of course: feel free to ask any question you may have, or discuss this directly when you are here. I am very flexible on my teaching and understand that different people have different learning styles, goals and motivation. As I mentioned before, I like to have fun, and this applies to life as well as in the classroom. I often use games, videos or quizzes to make the formal teaching part of the program enjoyable and light. Should you have a specific field on which you want to improve, just let me know and I’ll make sure we cover it in depth. 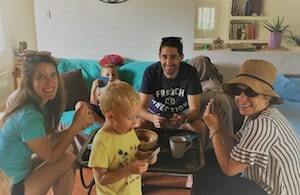 Being immersed in my family will also bring you lots of opportunities to talk French out of the classes: with my husband and kids, our friends, people in the village and during our excursions. Staying with a large family is the real added value of my immersion program and you will progress faster than you can imagine. Let me know if you have any question regarding my program in the form below. My family and I are looking forward to hosting you and help you develop your French skills. We hope to see you soon in Provence! 3. A few details about yourself: your hobbies, your French learning goal, the kind of immersion you'd like (little/lots of homework, outdoor or more indoor activities), any food allergies or other problems you may have. The teachers will be opening their own home to you and although they’ll ask you more questions if they are able to fit you in, knowing a bit about you from the start would be really helpful and a huge gain of time. Follow Virginie’s Bilingual Articles On French Today, Where She Talks About Her Beautiful Region. Despite taking high school French, private lessons and group classes at the Alliance Française for several years, I never felt that I progressed beyond basic French fluency. My goal was to learn enough French to be able to converse in French. I randomly found Virginie’s ad while researching language courses in France, and something about the ad caught my eye. I wanted an immersive language experience and knew that a one-on-one environment would force me to actually participate since there would be no other students to hide behind. I reserved my spot not really knowing what to expect. 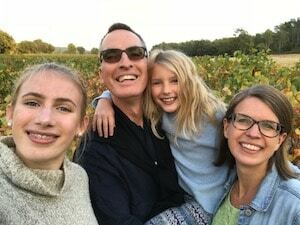 As I write this review, I have just completed a month in Provence with Virginie and her wonderful family, and the experience surpassed all expectations. Virginie and Alex welcomed me so warmly that I immediately felt like one of the family. My lessons began at 9AM most mornings with two excursions per week to locations around Provence. Virginie employed worksheets, conversation, vocabulary homework and many different games to incorporate new knowledge and reinforce previously learned concepts. The atmosphere was always low stress. It just felt like I was having tea with a good friend while we happened to speak in French. I also took advantage of the opportunity to play games with the kids who also helped me learn. Over the month, Virginie taught me new words and grammar, but most importantly she helped me gain the confidence to speak French. 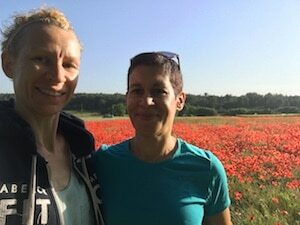 During the month, I was able to see so many parts of Provence with Virginie. 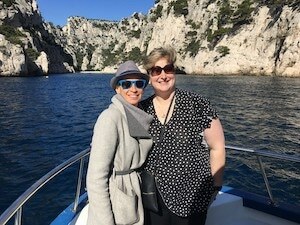 We explored Cassis and the calanques, St. Cyr-sur-mer, Arles, Aix-en-Provence (including a trip to see a movie), Salon-en-Provence, Saintes Maries de la mer, Marseille, Aigues-Mortes and the Parc Ornithologique to see the Flamants Roses (flamingos native to the Camargue.) 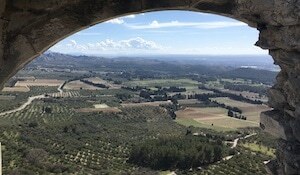 I enjoyed walking through farmers’ markets tasting tapenade, olives and tapenade de poivron rouge; taking a tour of a soap factory that makes the traditional Savon de Marseille; tasting Rosé wines at local vineyards; and visiting ancient Roman ruins and medieval churches. I rented a car for the month and made good use of it on the weekends. On my own, I visited Marseille, Chateau d’If, Avignon, Pont du Gard, Arles and Aix-en-Provence. Driving in the area was fairly easy with my Waze app making navigation simple. By the end of the month, I had explored so many places, but I know there are so many more things to see. Viriginie and her husband, Alex, are wonderful cooks. They prepared many different local culinary favorites like cassoulet, fondue, Mont D’or, ratatouille, fondant au chocolat, chocolate mousse, tarte au citron, tartiflette and Gardianne de taureau. They also served local pastry treats including the specialty of Aix-en-Provence, calisson. I also had the opportunity to cook with Virginie and Alex to learn how to prepare many of these Provençal dishes. The month flew by too quickly, and I am sad to be leaving this beautiful region. I highly recommend this experience to anyone looking to learn French and explore the South of France. I definitely plan to return in future years to continue my education. My friend and I moved to Paris a year ago, where we started our French language journey. We had been taking intensive French classes at a language school for almost 9 months and have been progressing well, but decided that we needed a change of learning environment to acquire the confidence to speak in our daily lives. That is when we stumbled across Virginie’s profile on FrenchToday, and decided to do a one-week immersion with her. It was one of the best decisions we made in our learning journey. During our one-week stay, we had 3 hours of “formal” lessons daily, but Virginie was very flexible to our needs, and we ended up having our lessons while cooking together, taking walks in the forest just a few steps away, playing card games, and even just having a lovely breakfast together every morning. We wanted to have more practical learning sessions and that was exactly what Virginie gave us. We requested to work on some grammar points and she managed to integrate what we needed into the activities we wanted to do. During our stay, we also had two excursions where we had the chance to visit the quaint little town of Arles and the animated Aix-en-Provence, both an easy drive away. Virginie was also our excellent tour guide, suggesting various options, taking us to the beautiful sights, exploring the colourful markets and trying the special cuisine of the region together with us. 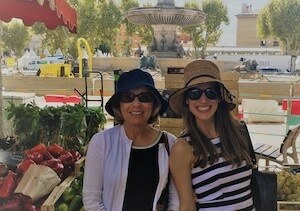 We were living the French life with her, speaking the language while discovering Provence and having so much fun in the process. The stress of speaking the language diminished and we left having much more confidence to use it back in Paris. This is something that we would not have gotten in a classroom environment. Virginie has a warm personality and her family were so lovely, making us feel right at home from the start. They gave us the privacy but were also open to us interacting with them when we wanted to. She had a cosy room for us with an attached bathroom, and all the amenities that we needed. The only regret we had was not trying the somatic massage from Virginie! She had offered us a session but we had so much to do together that we did not find the time. The one-week immersion seemed like a long time when we signed up, but we could have definitely stayed for more. Highly recommend this if you want to improve your French in an enjoyable, fun and effective way while having a mini-vacation in the south of France. Our immersion stay with Virginie and her family was brilliant. Virginie is an excellent teacher and a generous and good human being. 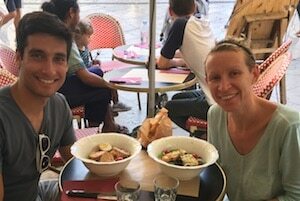 My husband and I improved our French a great deal and staying with Virginie and her young family was a real treat! To spend a week with Virginie was an adventure. I loved learning more about the intricacies of the French language whilst living a typical week in the life of a French family in a rural setting in southern France, about 15 minutes from the nearest town. 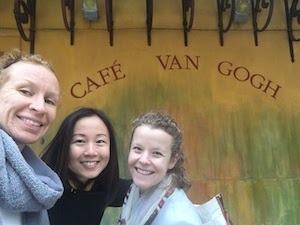 In one week, my French benefited from daily formal, structured lessons as well as the incidental support from Virginie whenever she corrected my grammar and verb tenses. The lessons were specific to my level of French, and Virginie was skilled at discerning where to target her teaching skills. Informally, Virginie and I discussed many topics. For example, French and Australian politics, and anything French compared with anything Australian. It was through these more informal discussions and visual interpretations of points of grammar where I felt my language skills and memorisation developed and expanded, where I was forced to dig deep for vocabulary, appropriate French phrases and to think quickly about correct verb tense. It’s possible to walk into Eguilles, or take a taxi ride for about ten euros. I explored the town on foot, bought un café et un pain au chocolat at the local boulangerie, and discovered the old stone laveries which were sought after by laundresses in the past due to the quality of the water in Eguilles. One of my more quirky souvenirs is a sample from Max Sauze’s eclectic gallery called Le Jardin d’Eguilles – well-worth a visit and, if you’re lucky, you may get to chat to the artist himself. He was dressed in red trousers and a mustard yellow jumper and eating his lunch on the day I visited his Dali-esque gallery and garden. Another highlight in Eguilles is the Catholic cathedral with a superb view over the surrounding countryside. I noted a plaque high on one exterior wall commemorating the death of a citizen of Eguilles killed for his involvement in the French Resistance movement. The excursions were fantastic! The time spent driving, walking and exploring allowed so many fruitful opportunities to work on my vocabulary, and expand my knowledge of French history, landscapes and local food. All in French, of course! Virginie and I spent time discovering Les Calanques. These are unique limestone cliff, beach and rock formations at the edge of the Mediterranean near the pretty port town of Cassis. Later in the week, we drove across the vast Valensole plateau, planted with acres and acres of neatly-pruned, grey-green lavender bushes. 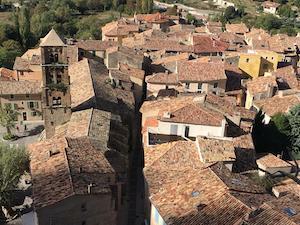 Our destination was Moustiers-Sainte-Marie, classified as un beau village de France nestled between canyon walls and built around a natural spring. We climbed the pilgrimage trail, crossing over the stone bridge between the walls of the canyon to the 12th century chapel dedicated to Notre-Dame de Beauvoir. 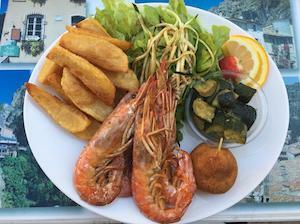 The day ended at a local restaurant with gambas steeped in pastis, the well-known liqueur of southern France – delicious! The week passed all too quickly with Virginie, whose teaching style was well-organised, thorough and dedicated to my needs. The challenge of everyday conversation was difficult but rewarding, and mellowed by a shared sense of humour. A week of immersion with Virginie is to be thoroughly recommended. 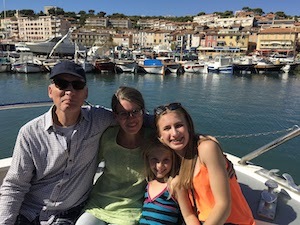 We had a lovely stay with Virginie and her charming family near the village of Eguille in Provence. 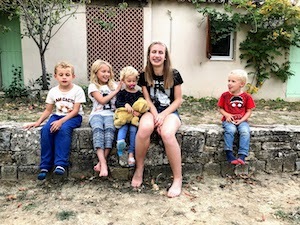 Our daughter who is 13 and has just started learning French at school had French lessons with Virginie in the mornings whilst the rest of us (mum, dad and an eight year old) hung out by the pool or in the village. As a young and motivated teenager, this is a great way of jump-starting your French learning. 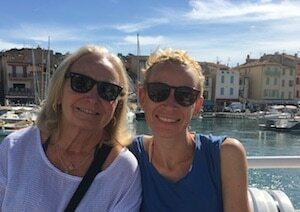 Virginie took us all on two wonderful excursions to the market in Aix-en-Provence and to Cassis and the seaside. 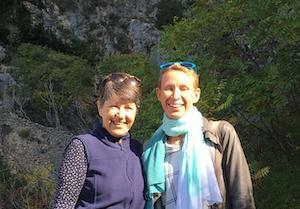 She was very flexible and helpful in any way and we all had fun exploring French and Provence with her. 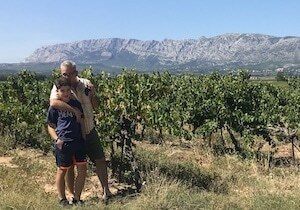 We decided against renting a car, which was a limiting factor, yet there are local taxis and the adults enjoyed the 45 minutes’ walk through the vineyards and the woods to the village. The house is lovely with comfortable beds, a nice private bathroom and a large garden. 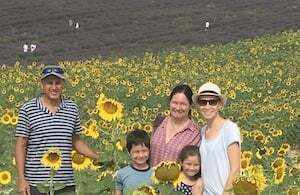 When you factor in flights and trains at school holiday prices, the total costs of the week for our family holiday were substantial but for us it was a great and happy experience. 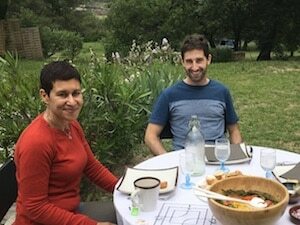 My son (13 years) and I spent a week of “immersion” with Virginie and Alex in her lovely home deep in the countryside outside of Eguiilles late last summer. For me it was a chance to review the language and to experience the place and people after years away. 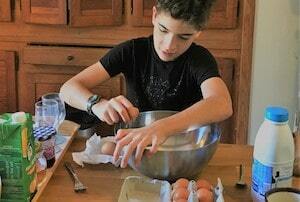 For my son, who had taken two years of “school” French, it was an opportunity to try out his modest skills in an authentic environment and make leaps of progress beyond what was likely in America. It turned out that we accomplished both goals, and far more. We nervously drove up to the house on day 1, but were quickly made to feel at home. Tucked between two vineyards with a mountain of pine trees running above and behind, the house was a true rural hideaway. The pool, trampoline, and nearby path up and into the forest made it an outdoor paradise; the accommodations and openness of the house to us gave us a whole world to enjoy and explore. Virginie and Alex were generous and attentive hosts throughout and welcomed my boy and me as friends and equals. Each day was a new experience, with the “course” modulating to our needs, my own and my son’s so different, and our tolerance for “classroom” study varying by the day. We experimented in the kitchen as a group, trying local wines, making local recipes (quiche and french toast! ), and wandering the local, and not so local urban attractions–one day visiting Arles, another doing a “ring road” around Mt. St. Victoire. 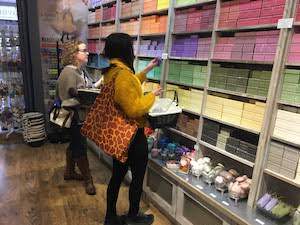 Throughout the feeling was casual and open, filled with the French language and gentle prompts to find le mot juste and to refine the accent. We had a blast, and our experience with Virginie and her family is now without hiccup or hesitation a wonderful, lasting memory of the trip. Ma fille et moi avons toujours aimé la culture française: l’art, la langue, les délicieux vins et le fromage. Nous aimons tout! C’est pour cette raison que nous avons décidé d’essayer une semaine d’immersion avec une famille française. Vivant près d’Aix-en-Provence, Virginie et sa famille nous ont ouvert leur porte —et leurs cœurs— pour rendre notre séjour inoubliable! Après un long vol des États-Unis, nous étions heureuses de voir Virginie nous attendre à l’aéroport de Marseille. Elle nous a conduit chez elle et nous a présenté son mari et leurs trois charmants enfants. 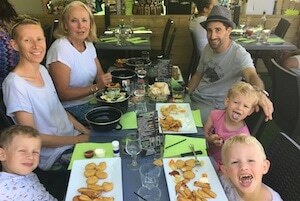 Ensuite, nous avons joué aux cartes avec les enfants, mangé un bon repas et dégusté des vins régionaux et le traditionnel bonbon aux amandes d’Aix: les Calissons. Après une bonne nuit de sommeil dans notre suite privée et spacieuse, nous nous sommes réveillées prêtes à apprendre le français. Chaque jour commençait sur la terrasse avec le petit déjeuner et les cours de français. Parfois, le chat, Fripouille participait à la discussion! Virginie est une prof formidable. Avec ses enfants, elle aime la méthode d’enseignement Montessori, et elle utilise le même genre de matériaux avec ses étudiants. Virginie nous a emmené dans un vignoble local et chez un chocolatier. Nous y avons acheté des cadeaux pour nos amis et familles. Elle nous a emmené à la boulangerie et à son marché bio préféré. Nous avons aussi visité Aix-en-Provence et Arles. Nous avions commencé notre séjour en jouant aux cartes avec les enfants de Virginie et Alex. Il était donc approprié que nous finissions notre séjour en regardant le dessin animé Les Simpsons que leurs enfants appellent « Spider Cochon »! Virginie est une excellente prof et sa famille est charmante. Nous la recommandons vivement à tous ceux qui souhaitent étudier le français en Provence. I stayed in the house of my teacher Virginie and was made to feel comfortable from the very beginning. The house is just outside of the village and is a community close to Aix en Provence. Our day began with breakfast around 8:30 and continued the noon meal. There is a road just beyond the house where a vineyard climbs the hill behind the house. I liked to walk several times a day up the hill to an olive orchard. On some days Virginie would join me, and we would have lessons while we walked. I enjoyed these lessons very much. Other times we would sit on the veranda behind the house, overlooking the pool, and have a more formal lesson. There was plenty of homework, which was helpful and enjoyable. We also traveled Aix for the market, and to other small villages to enjoy what they had to offer, and to continue our language lessons. My preference to small towns, and local attractions can best be exhibited by our trip into Eguille, which I enjoyed very much. 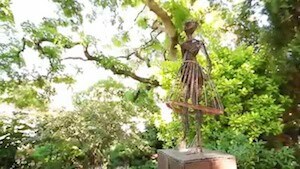 We visited a garden in the town, that boasted not only a variety of plants and trees, but also of naturalistic artworks completed by the owner. We also stopped by a local vineyard for some tasting of their wines. It is very easy to increase your language skills when talking about the things you are doing, or seeing, or tasting. I came to France with a small amount of French vocabulary, and less of the proper French sentence construction. With Virginie’s help I am much better in my communication and writing skills. As an appreciated bonus she has given me via paper, and via email, a variety of resources that I am taking home to help me progress in my French. I highly recommend both the immersion program and in specific Virginie. Thank you for helping me have a most enjoyable time in France. 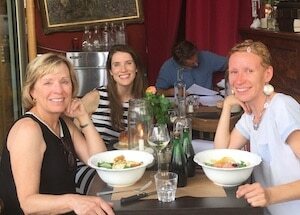 My weeklong stay with Virginie and her husband Alex in Aix en Provence was an amazing time. It was positive on all fronts. The French lessons were very flexible and customized to address my weaknesses and level. Speaking and listening comprehension are the main areas where I need improvement and Virginie made sure that we were talking all of the time. Her method of teaching certain concepts with topic cards was very fun and useful and allowed us to complete exercises while walking through fields or streets. The only area for improvement would be to have a review of the previous days learnings before beginning new topics. The location of the stay was fantastic as it was a short drive away from many cities in Provence. 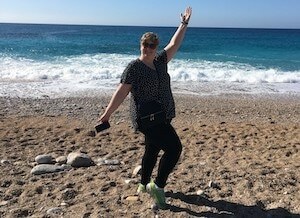 I chose to focus the excursions on exploring French towns and Virginie happily obliged, as we spent afternoons in Aix en Provence, Avignon, and Arles. Each trip was interesting and provided a lot of learning. Virginie and Alex even helped organize additional outings that I was interested in such as playing football. Their house was beautiful and I immediately felt at home and comfortable with my living space. The food made was delicious and generous, and I was happy that the meals were often French specialities. My week felt like I experienced a genuine southern French lifestyle. As a student for the next year in Paris, I am very glad that I chose to spend a week on a French immersion homestay. I would have liked to spend more time but given I will be paying tuition for the next two years, the price for more than a week was out of my range. Regardless, I’d recommend to anyone looking to improve their French and experience a true French life. 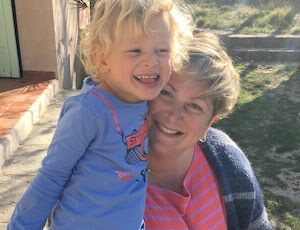 We really enjoyed our stay with Virginie, Alex and their lovely three children in Eguilles and would highly recommend them to others interested in learning French and experiencing life in Provence. We didn’t really know what to expect from our stay, as we had never done an immersion or homestay program before and were a bit worried about how our children (6 year-old twins) would react to being in a different home and country…however our time in Provence was truly delightful and we would go back in a heartbeat. 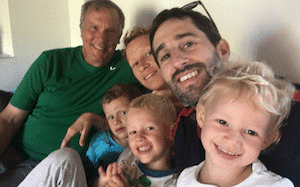 Virginie, Alex and their children were very welcoming to us, and quickly made us feel at home. Within a few hours of being at their house, our kids were already catching grasshoppers with Leo, Tom and Lily, chasing each other around the pool, and happily sharing chocolate cookies. Watching the kids play together – and try to communicate – was great fun for all of us. Virginie was a very patient, flexible and creative teacher and made learning French a lot of fun. 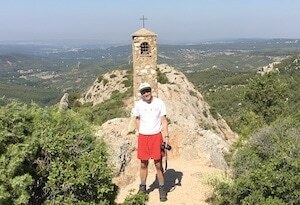 We really enjoyed our morning classes and our lunches together, and also appreciated the many excursions we did together to beaches, old villages, the lavender and sunflower fields, the Calanques, and much more. When Virginie found out that my husband was an avid birder, she even organized a visit to an ornithological park together to see flamingos! Virginie also gave us really helpful ideas for places to visit with our children, which made exploring the region much easier and lots of fun. 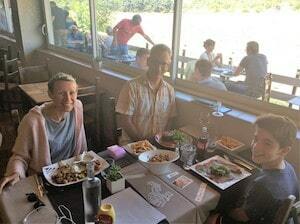 In short, we were incredibly happy that we choose to stay with Virginie, Alex and their lovely children, and hope we will have an opportunity to visit them again in the near future. J’ai passé une semaine très agréable chez Virginie et Alex ou j’ai fait des cours de français, visité le marché, bu des vins, marché dans la campagne et vu des films. Virginie est une prof très bien informé mais Alex aussi parle très bien anglais, donc dans le soir quand on a mangé ensemble c’était facile de parler sans confusion – en français mais aussi (quand je n’ai connu pas un phrase) en anglais. I would recommend Virginie to any English speaker who wants to improve their French and have a lovely Provençal break. Today marks the end of my week with Virginie and her family and I’m sad to go. They were very welcoming and I couldn’t have asked for better hosts. When I arrived at the airport, I heard someone call my name and turned to see it was Virginie. She approached me as if we already knew each other and this immediately put me at ease. Her husband, Alexandre, was also very friendly and their 3 kids were adorable and lively. Virginie was extremely accommodating. She made sure that I got to try all the French dishes that I was curious about and even suggested to me some I had never heard of. I tried escargots, légumes farcis, tropézienne, pain au chocolat and even Alex’s very own rosé. She also would change the daily schedule to suit me and what I wanted to do. 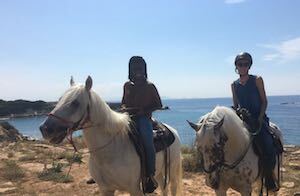 For our two excursions, we went canoeing along Les Calanques and horseback riding along the coast. They were both new experiences for me and I enjoyed them a lot. 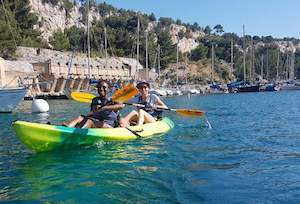 Even though canoeing for that long was tiring for us both, les Calanques was a beautiful sight to behold. I also loved the different views we saw while horseback riding along the coast and in the forest surrounding the ranch. Virginie also dropped me to Éguilles as well as carried me to the bus stop so I could go to Aix en Provence, and gave me a map for traversing each. Both towns had their own charm and I enjoyed exploring each of them. Concerning the French lessons, I wanted to work on my speaking and that’s exactly what Virginie ensured that I did. Not once did I speak English during my trip and Virginie taught me so many ways of sounding more like a native French speaker. In addition, I learnt a lot of new vocabulary and French expressions, not only from her but from her mother and friends who were also very friendly. While working on my speaking, we also simultaneously improved my writing. I learnt better ways to structure my sentences and she gave me written assignments to practise the vocabulary that I had learnt that day. All in all, it was an amazing trip. I was able to accomplish all I wanted to and more. I hope to return to Provence to spend another wonderful week with Virginie and her family. 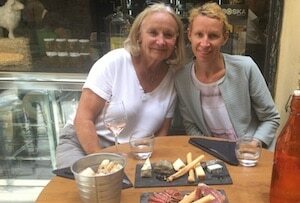 I had a wonderful stay with Virginie and her family. She is professional, a talented teacher and a very caring and fun person to spend time with. She made the experience of improving my French so much fun. She arranged for me to spend the morning at the local bakery to spend time speaking and learning about the art of baking wonderful breads. We visited an olive oil producer as well as an artisan chocolate factory. We traveled to the coast and experienced wonderful food and beautiful beaches. As you might guess my focus was on food and she wove that in with all of my French lessons. Virginie is an excellent teacher she adapted constantly to my French ability and I have greatly improved after spending a week with her. She was very flexible I need to do some shopping shortly after I arrived and she used that as an opportunity to practice some specific vocabulary. Her lessons very well structured and she gave me homework so that I could prepare for the following day. Virginie and her family were very welcoming and I felt at home immediately arriving. They included me in their day-to-day activities but also gave me a lot of space. I had a very relaxing week and enjoyed spending time walking in the beautiful area around the house sitting in the garden and enjoying Virginie and her family‘s company. The room was very comfortable, spotlessly clean and has everything one needs. I am hoping I can return next year with my own family. When we arrived Virginie and Alex welcomed us like we were part of their own family! 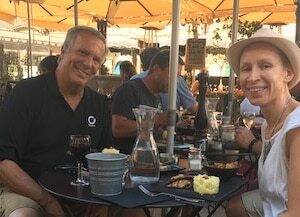 Our plan was to improve our French speaking skills and discover Provence with our kids and friends, Sarah and Brandon. We can tick both boxes after our stay here. Virginie succeeded also in responding to our requirements in terms of meals. July is vegan, Brandon and I love red meat and tasty burgers. Our kids even eat veggies well hidden in Virginie’s beautiful and delicious “quiches”. Everything was delightful! All the classes were adapted to our French level, especially for the kids who did not know any French word before coming here! Léo, Tom and Lily were also a solid backup for the kids and looking at all of them play and trying to communicate was a memorable experience. Virginie also gave us some useful tips so as we could correct our own mistakes by the end of the stay. The kids definitely made progresses that they could not have achieved without living in immersion with a French family like this. The evening story with the kids was a wonderful moment as well. 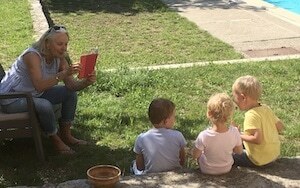 We were reading a local tale taking place in “les Baux de Provence” every day to 5 beautiful kids. What a joyful moment! Then we got to visit the actual village. It was incredible! The big advantage of staying in immersion at Virginie’s is that she knows exactly where to go to make parents and kids all happy! She proposed plenty of activities: zoo, planetarium, treasure hunt in Aix-en-Provence, visit of les Baux de Provence etc. She always insisted that we were doing in the lead to choose whatever we wanted to do! Before being a good cook and an awesome teacher, Virginie is also a beautiful person.